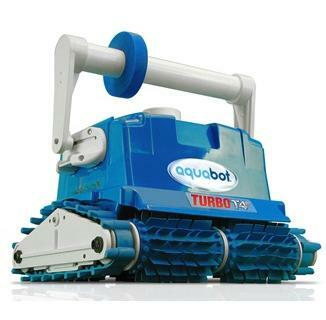 Aqubot™ Turbo T4 Remote Control Automatic Pool Cleaner with Caddy. The Turbo T4 automatic pool cleaner has the same quick cleaning state of the art technology as the Turbo T2 automatic pool cleaner and a remote control feature. The unit comes with a wireless 4-way remote control that allows you to guide the unit front, back, left and right. FREE SHIPPING! 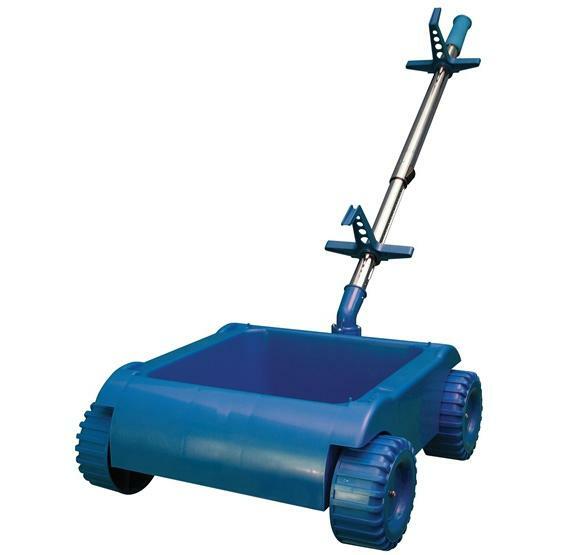 CLEANS ANY 50’ IN GROUND POOL IN 1 HOUR OR LESS AND HAS REMOTE CONTROL FOR QUICK SPOT CLEANS! The Turbo T4 automatic pool cleaner has the same quick cleaning state of the art technology as the Turbo T2 automatic pool cleaner and a remote control feature. The unit comes with a wireless 4-way remote control that allows you to guide the unit front, back, left and right. 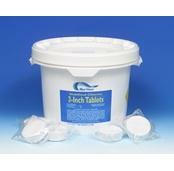 It is great for spot cleanups before your big pool party. Drop the robotic dynamo in you pool and it will be spotlessly cleaned in only 1 hour. Turbo T4 automatically shuts itself off after its 1 hour cleaning cycle is complete. Aquabot Turbo T4RC even comes complete with wireless 4-way, pin-point accuracy remote control, which should be handy when you need to take care of those last minute preparations before your next pool party. Want to know what makes Aquabot Turbo T4RC the most effective, reliable and powerful cleaner on the planet? Self-contained with onboard filtration system and drive and pump motors free operator from traditional cleaning methods that require pool's filter, hoses, booster pumps, assembly or installation. Automatic: Two internal microprocessor-guided drive motors direct its cleaning of floors, waterline and most stairs to completely clean pools up to 50' in length in just 1 hour. 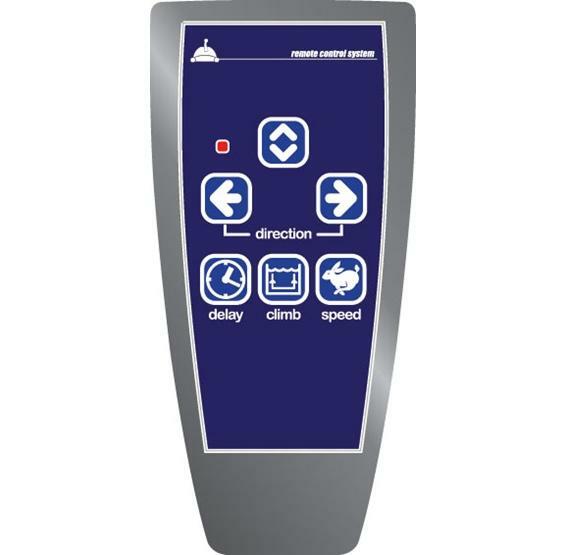 Manual Mode: Wireless handheld remote controls pin-point guidance for spot cleaning or access through unique pool configurations. Obstacle detection sensory network avoids getting stuck while microprocessor program systematically cleans without wasting time trying to "learn your pool", repeatedly cleaning same area or missing spots altogether. One hour cleaning efficiency reduces up to 85% of the wear and tear other cleaners incur, offering greater reliability. Rotating brushes loosen waterline build up and break down large debris while power washing jets flush out dirt from areas brushes can't reach. Off-center vacuum ports avoid clogging and access dirt along pool edge enabling everything from large leaves and twigs to coins, gum, hair, sand, silt and even microorganism 10x smaller than what most pool filters can remove to be trapped within its internal micro filter bag. Filters and circulates reducing main filter cleaning needs by up to 80% and operating time up to 25%. Steer this sophisticated robot in your pool this summer. Turbo T4 remote comes complete with the head, 75’ of cord, transformer and wireless remote control. Manufactured by the leading make of Robotic pool cleaners, it is backed by a 3-Year Warranty. UL listed. *Note: Aquabot's warranty covers units sold in United States, Canada & Puerto Rico. 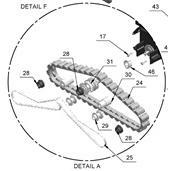 Sales to any other area void the warranty.